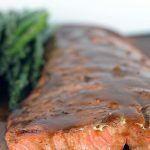 An easy and delicious grilled salmon recipe, easily adapted for the oven. Start by checking salmon for any small bones left behind. Remove any before cooking. Prepare marinade by whisking together mustard, soy sauce, olive oil, garlic, salt and pepper. Add just a pinch of salt, since the soy sauce is already high in salt, and pepper to taste. Pour just 1/2 of the mixture over the salmon filet and let marinade for 10-15 minutes. Oil grill grates very well, discard marinade and grill salmon skin side up over high heat for about 5 minutes. Carefully flip salmon and grill for about 5 more minutes depending on thickness. Transfer to plate and pour the remaining marinade/sauce over the salmon and serve. To prepare in the oven. Cook fish skin side down for about 15 minutes in a 425 degree oven. Make sure you have oiled or sprayed the cooking dish with non stick cooking spray. The recommended safe temperature for cooking fish to is 145 degrees. Remove salmon before it reaches this high as it will continue cooking off the grill. I prefer my salmon to be slightly underdone, so I will usually keep the thicker portion for myself and serve my kids the thinner, more well done portions.